"I love that Hair Love is highlighting the relationship between a Black father and daughter. Matthew leads the ranks of new creatives who are telling unique stories of the Black experience. We need this." 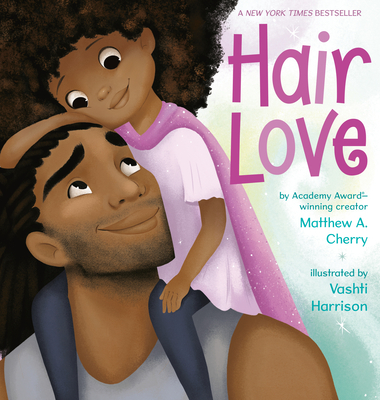 It's up to Daddy to give his daughter an extra-special hair style in this ode to self-confidence and the love between fathers and daughters, from former NFL wide receiver Matthew A. Cherry and New York Times bestselling illustrator Vashti Harrison. Zuri's hair has a mind of its own. It kinks, coils, and curls every which way. Zuri knows it's beautiful. When Daddy steps in to style it for an extra special occasion, he has a lot to learn. But he LOVES his Zuri, and he'll do anything to make her -- and her hair -- happy. Tender and empowering, Hair Love is an ode to loving your natural hair -- and a celebration of daddies and daughters everywhere.